Kristina Stykos is a woman with many faces: a singer-songwriter, a mother, a recording engineer, a guitarist, a flower gardner, a poet. Born in Ithaca, NY she lived and worked in Boston, MA before she moved to Vermont in 1980. She is married to guitar maker Michael Millard, founder/owner of Froggy Bottom Guitars and has three children. She runs a professional recording studio producing acoustic and other types of contemporary music and is active as a performer and songwriter. Located at the end of a scenic dirt road in Chelsea, VT, Pepperbox Studio is solar, wind and generator powered. a singer-songwriter, a mother, a recording engineer, a guitarist, a flower gardner, a poet. Born in Ithaca, NY she lived and worked in Boston, MA before she moved to Vermont in 1980. She is married to guitar maker Michael Millard, founder/owner of Froggy Bottom Guitars and has three children. She runs a professional recording studio producing acoustic and other types of contemporary music and is active as a performer and songwriter. Located at the end of a scenic dirt road in Chelsea, VT, Pepperbox Studio is solar, wind and generator powered. 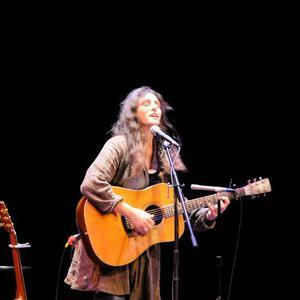 She plays acoustic guitar made by her husband and luthier Michael Millard, mandolin and piano. After her self-recorded release ?In The Earth's Fading Light? was designated ?Best Vermont Album of 2005? by the Barre-Montpelier Times Argus, Kristina went on to further her audio engineering education at the Berklee School of Music's online school. She recorded her next full length album "One Clear Moment" (2007) as a band member of Wagtail, and has gone on to produce and engineer many other albums for and with local artists. Her newest album ?Raven? (2011), is a collaboration with Grammy nominated pianist Philip Aaberg and is on the Sweetgrass Music label. It was co-produced and recorded at Pepperbox Studio and The Bin in Chester, Montana. Kristina currently performs regionally throughout the Northeast in a trio supporting songwriter Bow Thayer. Their project is known as "Bow Thayer and Holy Plow" and also includes fiddler Patrick Ross. They have released one album: ?Shooting Arrows at the Moon? (Bow Thayer, 2009) and are working on new tracks for release in 2011.